Here’s a picture of my father and his three didn’t-fall-far-from-the-tree offspring. This is a recreation of sorts of a very old picture of Dad carting Mason and me around on his back. We were riding him like a horse in the time before Tohner was born. We were talking about that picture one afternoon a decade or two ago and decided to reenact it. Perhaps we’d had a few drinks. I remember thinking that this was maybe one of the best ideas of all time, and you can see in the photo that I can barely breathe from laughing so hard. 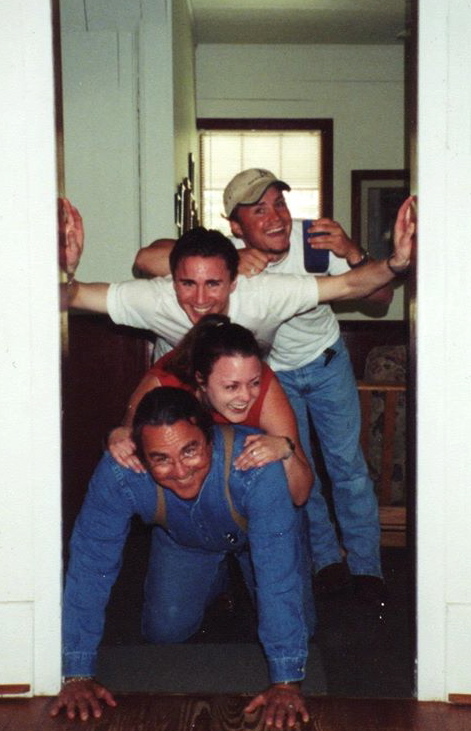 Dad insisted that we all get on his back (he’s always been a tough mofo). I complied. Mason didn’t relish the thought of a) breaking Dad’s back or b) lying on top of his sister, so he supported his weight with his hands. Tohner, who wasn’t in the original photo, leaned in. Mom snapped the shot, just as she had so many years ago. There’s been only one downside to this move–being so far away from the people we love. I’m sad to have missed the Father’s Day gathering at my parents’ today. But I got to talk to my dad on the phone, and for that I am grateful. Next Post if a writer falls in the woods, will she make a sound?